Religion is not a bad thing. 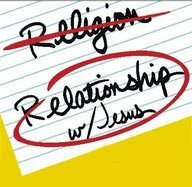 Have you ever seen the bumper sticker or the t-shirt that says something like “Christianity is not a religion, it’s a relationship”? And of course we all know that the greatest theologies fit on bumper stickers. You might have even heard it said in church before. It implies that religion is bad and that relationship is good and that’s true if religion is what we’ve made it to be. But what if religion isn’t so bad? Usually those who hold to this line of thinking will say that religion is simply a set of rules and regulations. Ironically the same people who say this are those who believe that Christianity is about believing a list of theological truths or dogmas. Well, it’s true that religion can be defined as a set of rules and regulations but only if it’s separated from relationship. It’s not religion that is bad. What is bad is that we’ve separated religion and relationship when in reality you can’t have one without the other. Both religion and relationship carry a common essential; devotion. Devotion is that binding force upon which religion hangs and relationship is preserved and restored. Disciplined devotion is what makes a religion, without this it’s not a religion it’s just a belief. Religion is the acting upon of a particular faith or belief. Without religion our faith is dead, our relationship is dead. We believe that we are in relationship with God. If you believe the Bible you believe that all people have a relationship with God of some sort. That’s just the belief though. We believe in a relationship but until we act upon it it’s still just a belief. Religion is what makes it a relationship. We live out this relationship intentionally, specifically, and with great discipline. We do not simply carry ourselves around with the pleasant thought that God is with us and loves us. We actually go out of our way, deviate from our plans, sell all that we have so that we might follow this God. That is relationship. That is religion. The common misconception is that religion is about what you do with your body or mind. This is true but we mustn’t limit religion so much. Religion can also be about the heart. Ours is a religion that is primarily about the heart. What you do loses its flavor if it’s not done with the heart. Our religion dies without the heart. If we take away passion, if we take away love, if we take away the true reason why we do what we do then it’s no longer the Christian religion. God is after our hearts. A relationship that has no heart will surely die just as will a relationship without religion.